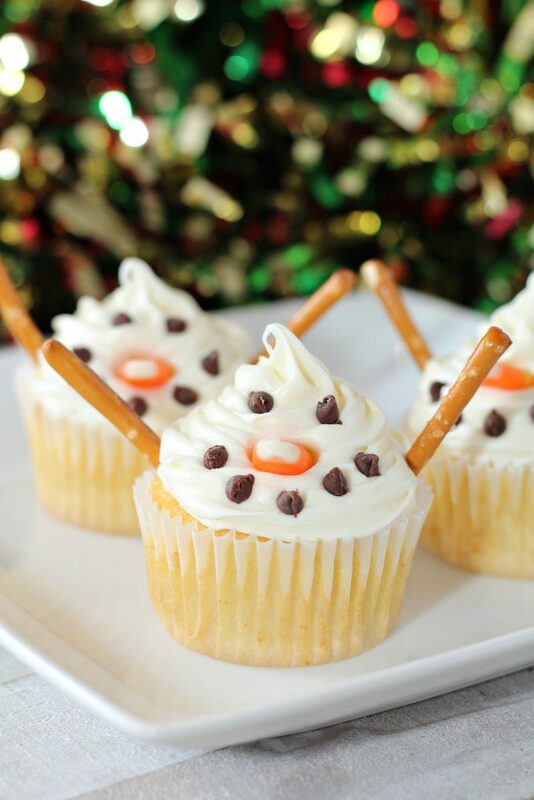 These easy snowman cupcakes are the perfect treat to turn into a family project this holiday season. Even the littlest members of the family will enjoy decorating these yummy vanilla cupcakes and taking them from plain cupcakes to full of festive fun. These snowman cupcakes turn box cupcakes into special seasonal treats, great for any holiday party, gathering or even a holiday bake sale. Do you ever feel like sometimes you get too ambitious with a Christmas baking project? Like you set out to make something super easy and kid friendly but then boom! It blows up and you are elbows deep in Pinterest and google trying to save your a-err, simple project? Well these easy snowman cupcakes are not that project. 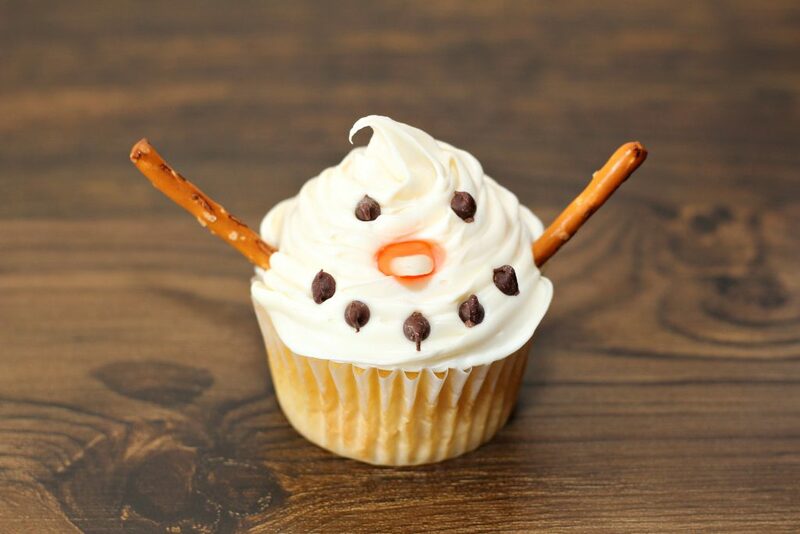 These easy snowman cupcakes won’t make you tear your hair out in frustration. No one will cry. There will only be sounds of jingle bells and laughter. And with my boys… probably a few fart jokes thrown in because ’tis always the season. 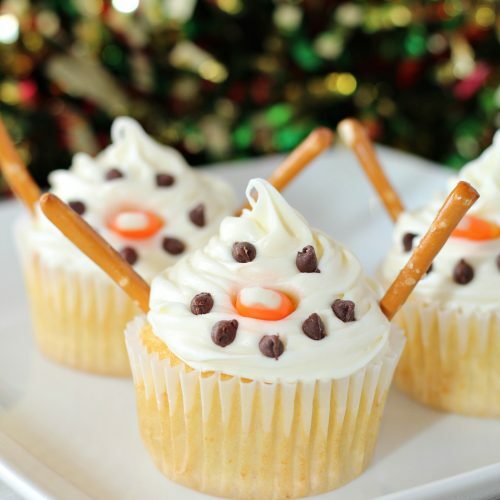 In fact, these snowman cupcakes are so easy that they’d be perfect to do with even preschool age kids. Because there’s no secrets. Nothing hard or fancy. No deep dive on Pinterest needed. No weird ingredients. 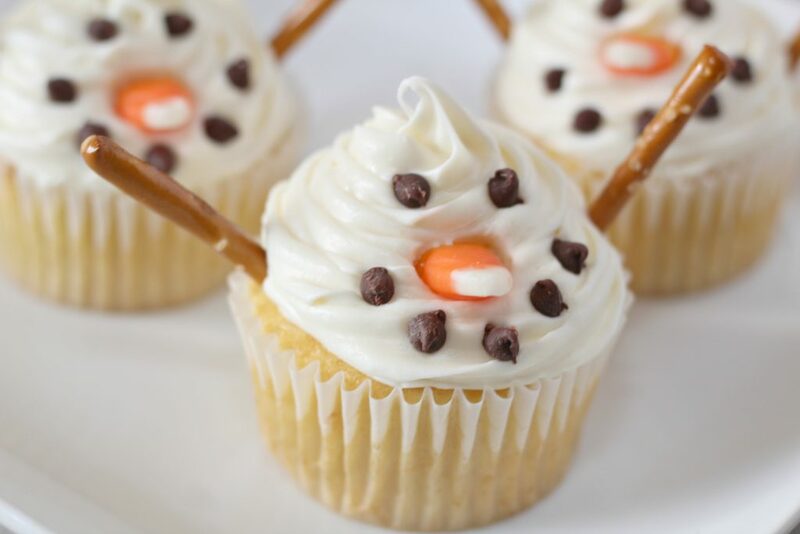 All you need to turn these cupcakes into adorable little snowmen is vanilla icing, pretzel sticks, candy corn, and little chocolate chips. That’s it. You definitely won’t break a sweat assembling the ingredients you need for your snowmen cupcakes. And you won’t struggle to decorate them either. 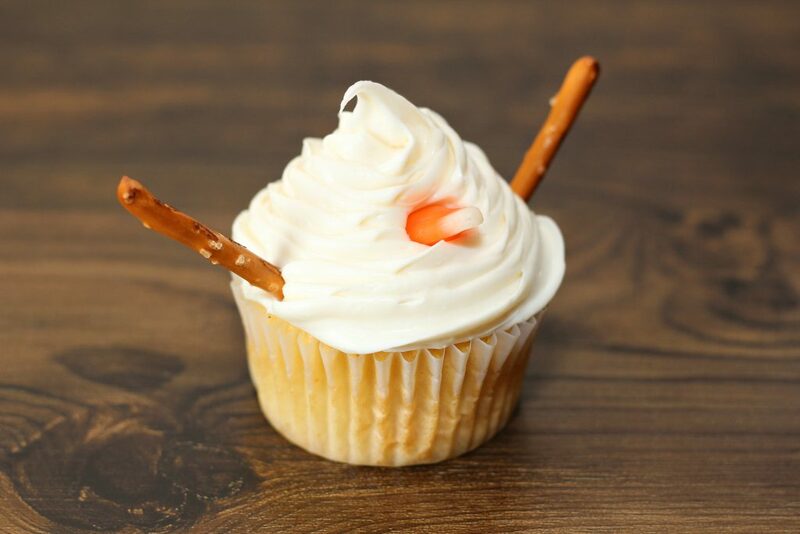 Start by piping on a hearty dollop of vanilla icing onto each cupcake. Don’t have piping skills or want the kids to do it? That’s absolutely fine too. You can spoon on a big dollop of icing without piping. That will work just fine too. 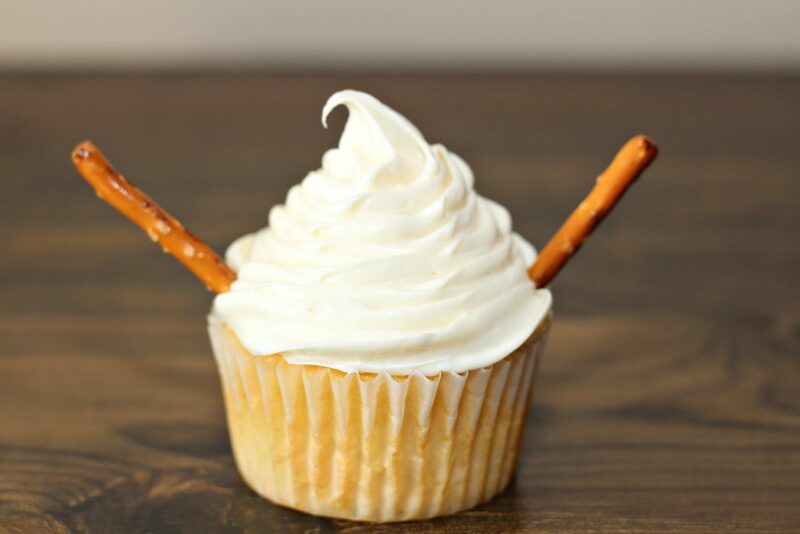 Then stick two pretzel sticks as arms into opposite sides of the bottom of the icing so that they stick into the cupcake at an angle. Next, take some of that leftover candy corn from Thanksgiving and Halloween and put it directly in the center of the arms with the yellow part covered in the icing. And now our snowman has a cute carrot nose. Just add two mini chocolate chips as eyes and and 5 or so for a smile. All done! Plain vanilla cupcakes all dressed up for the holiday season without breaking a sweat. And even the my littlest could help. How’s that for some Christmas magic? Shoot, and never one to put any cupcake in a corner, these are perfect all Winter long. I know what I’m bringing to the youngest’s classroom party this year! A simple vanilla cupcake, topped with vanilla buttercream uses simple additions to transform into a snowman to all the children's delight. It's perfect for Christmas & Winter alike. Start by preparing your cake batter according to box instructions. Fill your cupcake liners 1/2 of the way full. Bake cupcakes according to box instructions. After baking let cool completely. If you choose to use a icing pipping kit, fill your icing bag with your white icing. Start in the middle of the cupcake working your way out and up with the frosting. I placed my cupcakes in the freezer for about 5 minutes to allow the icing to stiffen up a bit before adding the pretzels. Next add two pretzels to each side of the cupcake for "arms". Add one candy corn for the nose and several mini chocolate chips for eyes and a mouth. How fun are these?! I love projects like this that are super cute and totally doable. Plus my little guy would love to help make some.